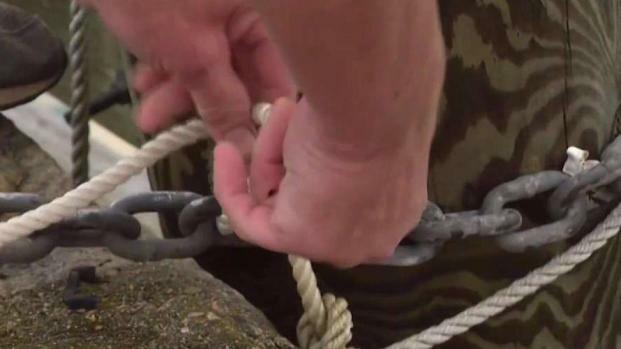 The harbormasters in Plymouth, Massachusetts, and other communities along the Cape, islands and south shore have a message — get your boats out of the water, or at least secure them. Coastal residents were bracing for a three-day storm beginning Tuesday afternoon as Jose got closer. "In the past I’ve left it in until November, but with the storms that are coming, the other storms they’re kind of watching, I think it’s best to pull it in now. Season’s over, school’s back, that’s it, it’s over," boat owner Anthony DiMaggio said. As of Tuesday morning, about 400 boats were still in the water at various marinas. 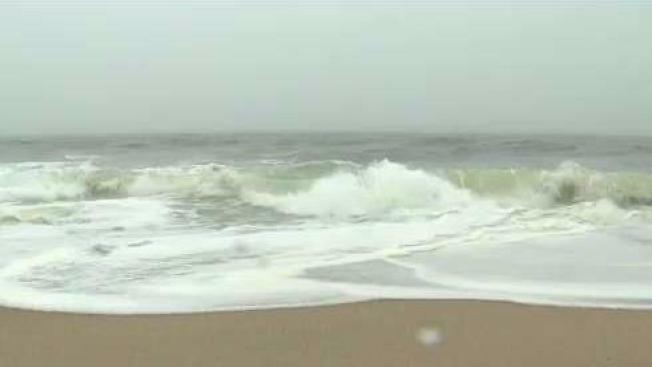 Residents along the coast of Massachusetts continued to prepare themselves for the potential impact of Jose on Tuesday. "There's still so much more boating season left. I think it would be premature to take them in now," said Erin Perry, another boat owner. "We've had some worse hurricanes and it's coming from the other direction," added boat owner Matthew Perry. "So we're pretty sheltered in this harbor." Plymouth Harbormaster Chad Hunter urged boat owners who choose to keep their boats in the water to add storm lines and make sure the batteries were charged. 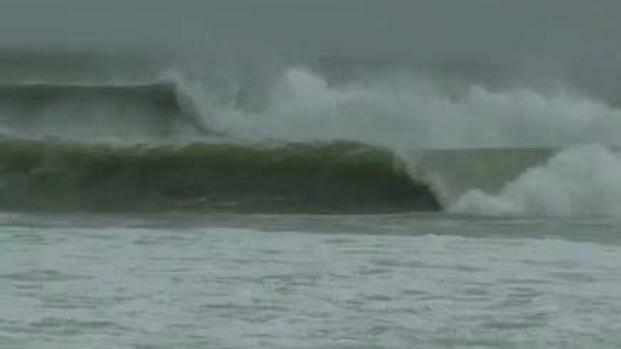 On Nantucket, rain was falling all morning Tuesday, with waves two or three times larger than normal. And they were only expected to get bigger as Jose gets closer. Joe Conway, manager of Nantucket Bike Shop, spent the day preparing for the possibility of flooding. "We're basically shutting down for an entire season and then reopening again for the weekend so it takes a toll on the business," Conway said. With Jose approaching New England, people along the coast are bracing for its impact. By nightfall, Jose was downgraded to a tropical storm but the mere threat had already turned many tourists away — keeping crucial customers out of harborside stores. "I'm hoping that it clears by Friday so we can get all of the foot traffic for weddings and everyone else who wants to come to the island this coming weekend," said Mary Garufi, owner of Natucket Peddler. The surf didn't keep every tourist away though. John Bardugon, who was visiting from New Orleans, took out a beach chair and watched the waves. "There were waves going backwards and forwards," said Bardugon. "They're up to 25-30 feet in some places, so really breaking a lot of undertow. They're beautiful. Just don't get too close to the water." Earlier in the day, the strong surf provided a new landscape for photographer Sanchez Saunders. "When the waves are like this, it's like, it gives a beautiful abstract," he said. 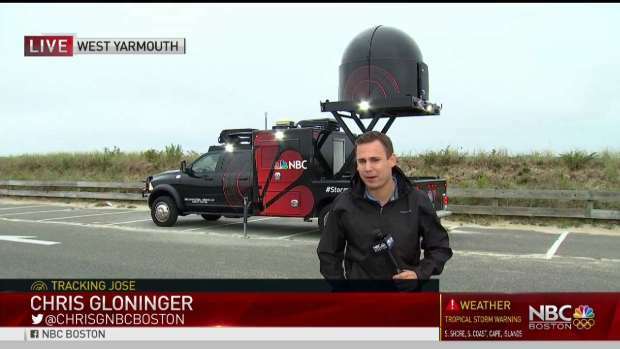 Meteorologist Chris Gloninger is in West Yarmouth with the Storm Ranger tracking Hurricane Jose's path. The rough waves forced the cancellation of whale watching trips for the next three days. The final ferry traveling from Martha's Vineyard also departed Tuesday morning. Sixteen flights into and out of Logan International Airport to airports in Martha's Vineyard, Barnstable, Provincetown and on Nantucket had also been cancelled as of Tuesday morning, according to FlightAware.com.